NordicBet makes sportsbook available for iPhone users, but why so many steps to place a bet? Image 1. 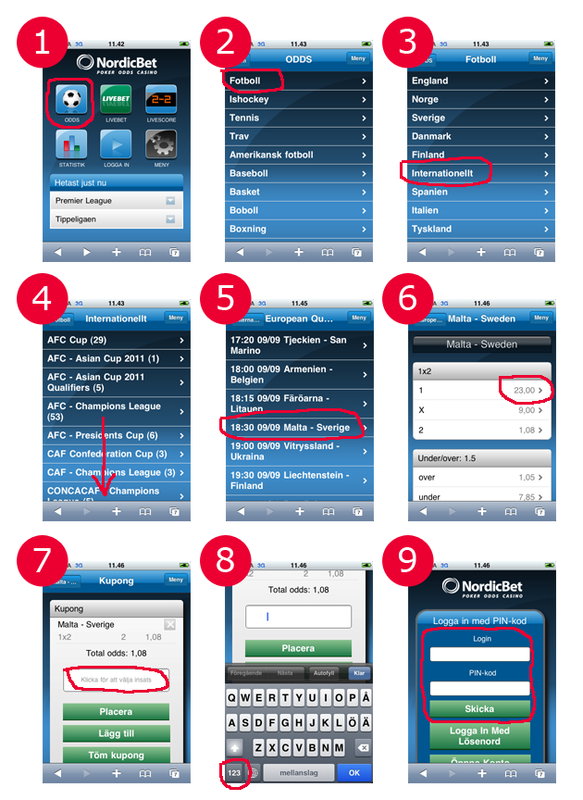 The steps to place a bet on NordicBet’s iPhone site. I read on the Gaming Intelligence website that NordicBet has released a iPhone version of their sportsbook together with Mobenga. I thought I would try it out since I love my iPhone and gaming. So I started Safari on my iPhone and typed in www.nordicbet.com in the address field. But then I got to the ordinary website insted of the one optimized for the iPhone. After looking around a little on the website I found a banner about the iPhone site, clicked on it and it said the address was mobile.nordicbet.com. Here I think NordicBet is making a mistake. Most iPhone users are used to watch real websites and not a mobile version since Safari is such a good browser on the iPhone. Insted I think NordicBet should either transfer the user to the iPhone version when they know it is a iPhone user surfing on their site, or quickly let the user know that their is a iPhone version available. But once I went to mobile.nordicbet.com I was pleased to see the page looking like an iPhone app. It looks really good. What do the user want to do on their page? They want to place bets! So I tested one scenario “Place a bet on Sweden as the winner in tomorrow’s World Cup qualifier match Malta versus Sweden”. In the image above you see the steps I had to go through to place the bet. It is way too many steps (9). The user experience is not just about the graphics but also about how easy it is to use and accomplish the tasks the user want to accomplish. And it sure wasn’t easy to place a bet. I am sure more gaming operators will adjusted their portals for the iPhone really soon, when you do don’t forget to optimize the user flows. It will be worth it!